twinme requires users to grant as little access as possible to their device features so as to guarantee maximum freedom & privacy. 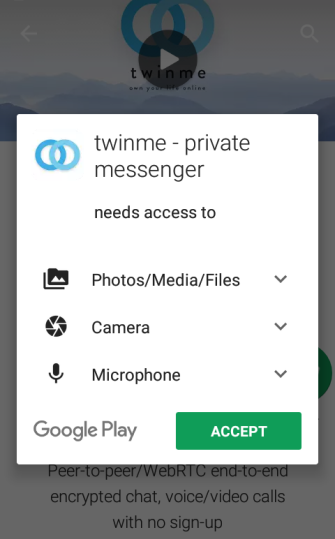 No other private messenger asks for so few permission like twinme (as illustrated by Signal below). 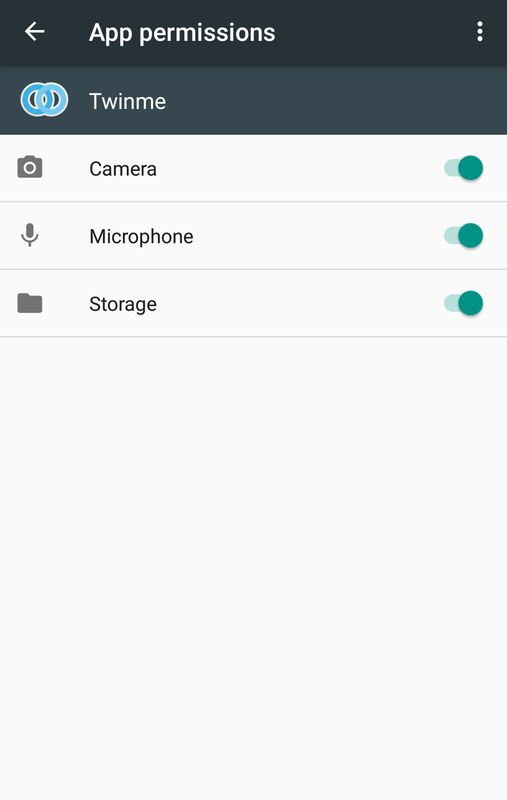 – Storage (SD-card) in order to access multimedia contents (photos & music), which you want to share. 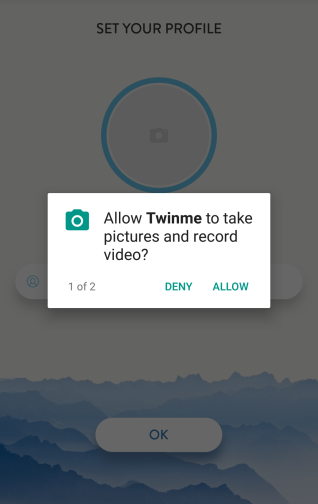 twinme asks you for permission before you use any of these features for the first time & you can choose to “Allow” or “Deny” access as you go along. 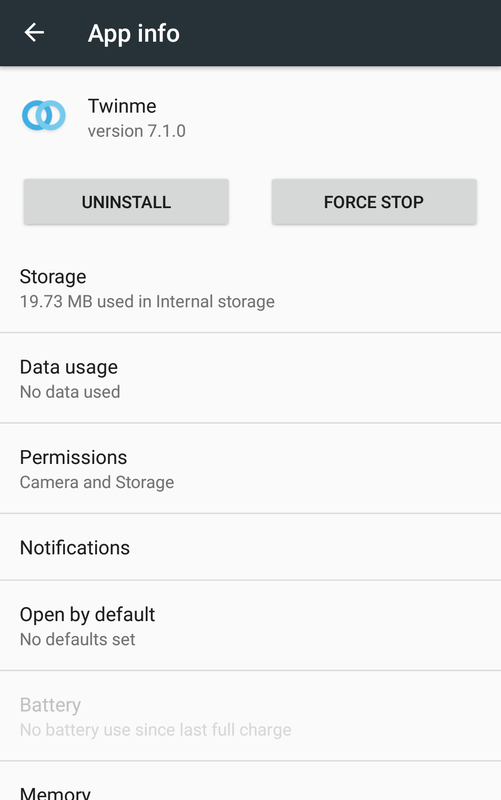 In addition, on the latest Android versions, beginning in Android 6.0, you can also revoke a permission at any time, by going to the app’s Settings screen. To get started, twinme asks to grant access to either the camera or media stored on your device to define your default profile picture. You need to grant either one –at least momentarily- to create a default profile that will be used to invite your twinme contacts. twinme allows you to share photos (and soon videos) taken on the spot within a chat conversation. 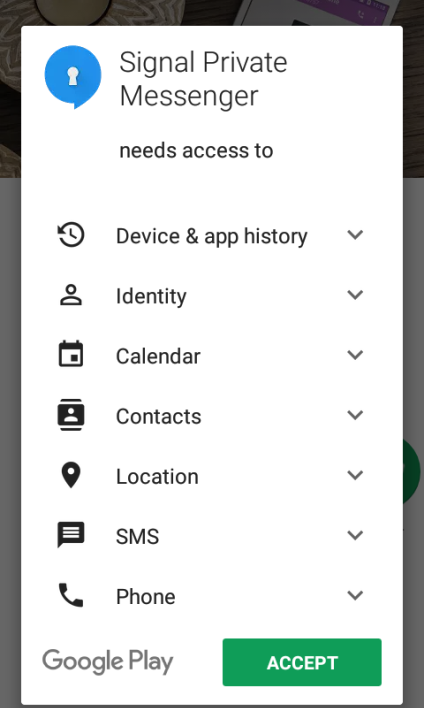 If you choose to deny access to the camera, you will not be able to take pictures when you tap on the camera icon. twinme allows you to make HD video calls. If you choose to deny access to the camera, you will not be able to make video calls. When you meet someone “In-person” and want to connect with twinme, you can scan his/her QR-code with your camera. If you choose to deny access to the camera, you will need the other person to scan your QR-Code instead. The microphone allows you to make voice & video calls and is required when you want to record audio messages. 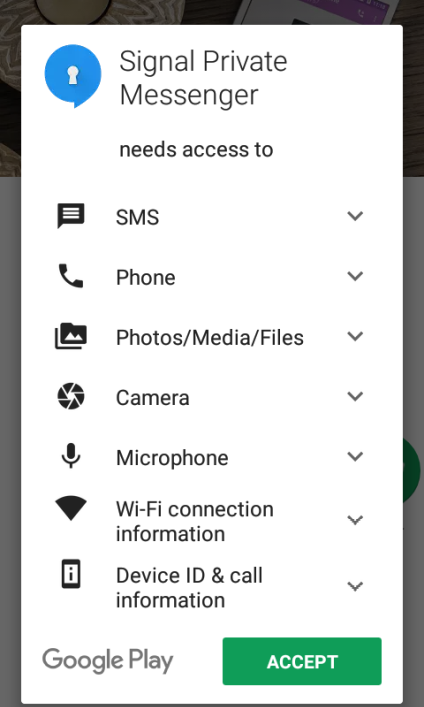 If you choose to deny access to the microphone, you will not be able to use those features. To get started, twinme needs access to either the camera or media stored on your device to set your default profile picture. You need to grant either one –at least momentarily- to create a default profile that will be used to invite your twinme contacts. When you tap on the camera icon in a conversation, you can access photos stored on your device. If you deny access to the media storage, you will not be able to send photos. 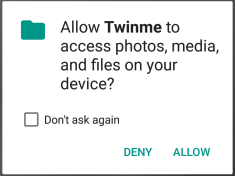 How do I modify the permissions granted to twinme on my Android phone? 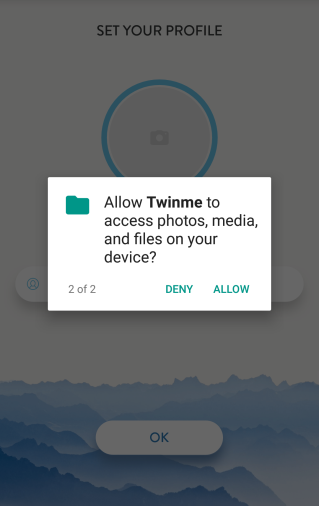 On the latest Android releases, beginning in Android 6.0, you can modify the permissions granted to twinme at any time, by going to the app’s Settings screen: Settings > Apps > Twinme > Permissions.